I have previously posted schematics of the design, but since cleaned those up. It's 8x12 insulated with a 12x16 enclosed run. This coup has electricity with built in light to prolong laying season and regular outlets for water heaters/fans. It's a converted 8x10 shed, with hollow walls and lowered ceiling. It houses my quail & pheasants within cages. This coup has electricity with built in light to prolong laying season and regular outlets for water heaters/fans. Not yet built, but below is an image of the design. After having a learning experiance raising meat chickens in Chknshk #2 and having to constantly muck it out with a shovel, this design came into existance. It will be fully accesible to a tractor (Deere 2305) with a bucket, so that the smell & amonia concentration can be easily contained. Both sides will have a 'convertible roof' and a swinging gate for ease of cleaning and access. 1. 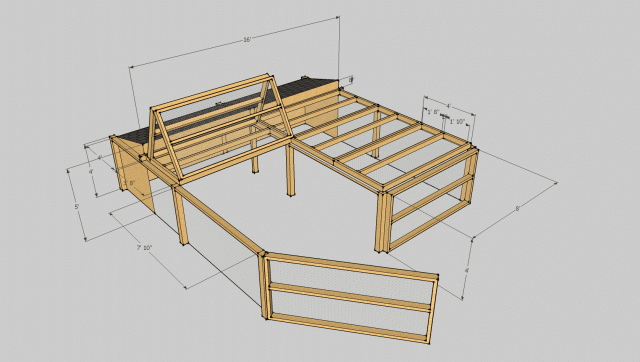 Google SketchUp (free 3D diagraming and design software). Indispensible tools for making blueprints for my designs. "An excellent concept that needs fleshing out"
This would make a really good meat-bird pen, but it's hard for most people to get the big picture from schematics. Some pictures during and after the final build would go a long way! Plans are always a plus but would love more details and pictures of the build!